Basil comes in several cultivars and sizes, but there are common characteristics among all of them. The flavors are different, which makes it easy to enhance a wide range of dishes and cuisine once their leaves have been identified. Visual cues can be suggestive, but they alone cannot confirm a basil leaf's identity. 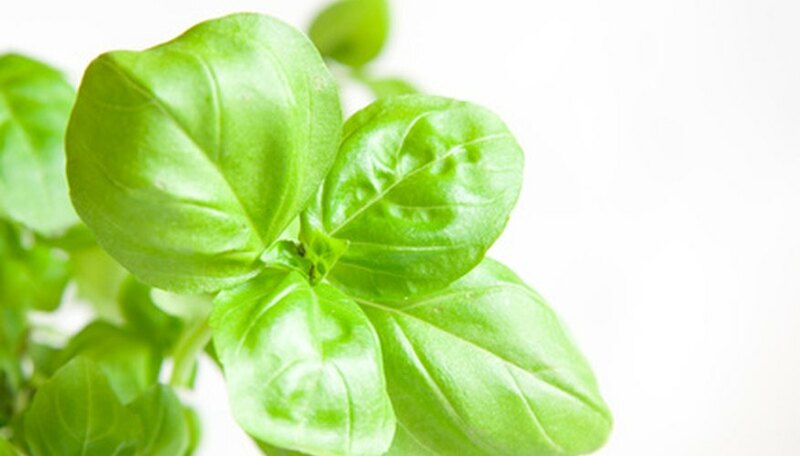 Sweet basil, also called Italian basil, has smooth, bright green leaves. They do not have serrations along the edge, and have very fine, light green veins you can see fairly easily upon looking at each leaf. The bases of the leaves are somewhat rounded, and each leaf as a whole is rather fat before it narrows to a pointed tip. The leaves may sometimes curl under at the edges, giving them a somewhat puckered appearance. When brushed, the leaves exude a powerful basil smell. Genovese basil is similar, but the leaves are slightly smaller. Thai basil has smaller leaves than sweet basil, and they are somewhat lighter. They are also lightly serrated along the edges, and the veins stand out at a bright greenish yellow against the leaves. Stems are dark purple. Unlike young sweet basil, the stems are tough and should not be eaten. The leaves are smooth, and, when brushed, the smell is like a stronger version of basil. Another type of basil is used in Thai cooking. Called holy basil, its leaves are darker green and somewhat more elongated than most other basils. These leaves are usually not eaten; instead, they are cooked in a broth or curry and used to flavor it, then discarded before eating. If a gardener is familiar with bay leaf use in cooking, the process is similar. Holy basil is never eaten raw. Lemon basil is similar to Italian basil, but the leaves are smaller and smell somewhat lemony. Purple basil has purple leaves, but is otherwise readily identifiable as basil. Lettuce-leaf basil features the common characteristic shape and vein markings of sweet basil, but the leaves look like lettuce. Cinnamon basil is somewhat spicier and may have reddish stripes on its leaves in addition to purple stems. Other, less common types of basil also exist. The easiest way to identify basil, without even looking at it, is to smell it. Anyone who has ever touched a basil plant can instantly identify the smell that wafts from it. Lemon basil, cinnamon basil and Thai basil all smell like basil mixed with something else. In these and in all other types, that unmistakable basil odor is readily identifiable. All basil have leaves that can be eaten after the flowers and produces seed. However, while the scent of the leaves may not change much, the flavor will change considerably. It will become stronger, more bitter, and more harsh than it was before flowering. For a longer change to harvest comparatively sweet basil leaves, gardeners are advised to pinch off flower growth as it appears. This will prevent the bitterness from setting into the leaves once a gardener has identified them.